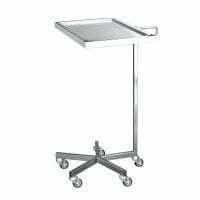 An instrument table serves to carry and keep the required surgical instruments accessible in the operating room. 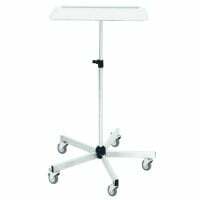 In our online shop for clinical supplies, you can purchase from a nice selection of instrument tables and compatible accessories at affordable prices. 498,00 EUR* Not ready for shipping. Reserve today and we will ship as soon as possible. 146,03 EUR* Not ready for shipping. Reserve today and we will ship as soon as possible. from 395,90 EUR* Not ready for shipping. Reserve today and we will ship as soon as possible. from 317,00 EUR* Not ready for shipping. Reserve today and we will ship as soon as possible. 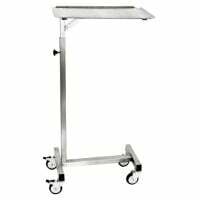 Instrument tables are used in operating theatres for keeping the surgical instruments accessible, which will be required for the operation. Most often, an instrument table will have a raised edge to prevent the instruments from rolling off of the surface. Instrument tables are usually made of stainless steel, as this material is quite easy to clean and disinfect. 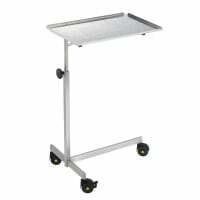 A wheeled frame with double castors mobilizes the instrument tables, which is a huge benefit during the constantly changing space requirements during the operation. 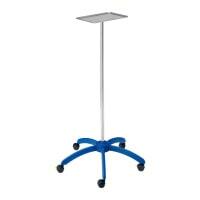 Furthermore, an instrument table is often height adjustable so that it can be perfectly set, based on the needs of the surgical team. 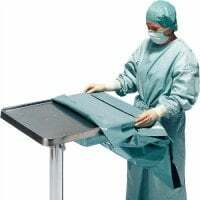 With Praxisdienst, you receive a nice selection of high-quality instrument tables and compatible, sterile instrument table covers at affordable prices. Additionally, you will also find surgical instruments, as well as diverse disposable instruments and surgical supplies for surgical applications of all kinds.